There is currently just the 1 ferry route running between Pico and Sao Miguel operated by 1 ferry company – Atlanticoline. The Sao Roque to Ponta Delgada ferry crossing operates weekly with a scheduled sailing duration from about 14 hours. Whilst we’ve taken great care to ensure the information on this page is correct, as the frequency and duration of crossings on all routes can vary from time to time we’d advise that you get a live quote for current availability on this Pico Sao Miguel crossing between Sao Roque and Ponta Delgada. Sao Miguel, the largest island in the Portuguese Azores, measures just over seven hundred squared-kilometres in the North Atlantic. 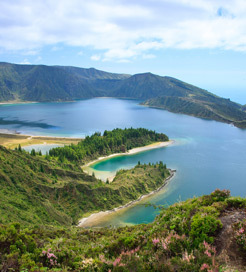 Two volcanic ranges, three crater lakes and the largest city of the island group, Sao Miguel offers everything that makes this archipelago so wonderful. And although life moves at a gentle pace, there is plenty to excite. 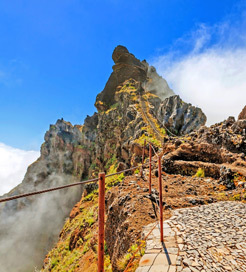 The vibrant capital, Ponta Delgada showcases some of the nation’s finest 17th Century architecture, museums and restaurants, whilst the award-winning Terra Nostra Park boasts some excellent walking trails. The most sumptuous views can be found throughout the Furnas valley towards the east, with its beautiful flower-lined lake, botanical garden and countless hot springs. Sao Miguel is part of the Azorean Eastern Group, with nearly every island providing ferry routes to Ponta Delgada. The journey times can vary considerably from each island, so depending on where you depart, booking some spacious accommodation is advisable.